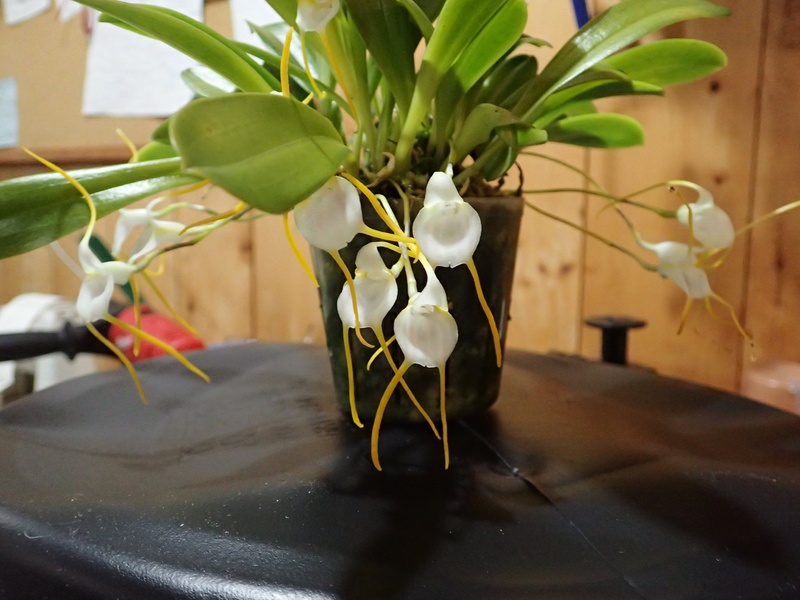 Discussion in 'Orchid Species' started by Chuck-NH, Apr 9, 2019. Plant deserves to have a better photo, but this is what I have. I just realized that this may be one of the oldest plants in my collection. It has lived in as many as 4 different greenhouses and in a kitchen window. It probably has had more than one “close to death” experience and has been in both warm and cool (currently) growing conditions. And every Winter it provides long-lasting, fragrant blooms. Thomas, wpinnix, rico and 1 other person like this. Wonderful background and beautiful plant. I like the contrast of the "tails"
I am slowly trying my hand at Masdevallias again. If I can come across this one, I will scoop it up! Hopefully I will do half as well as you have done with yours. Very nice and well grown! Beautiful grown plant. Love the white flowers. Well done. Thanks André, Nice to see you online again!